Protyre Formula Renault BARC will once again join the prestigious TOCA support package of the British Touring Car Championship for the leading single-seater category’s final two rounds in 2012, triggering several revisions to the championship’s provisional calendar it has been announced today. 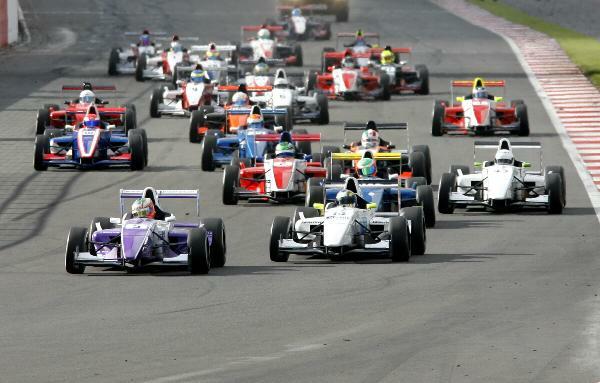 As this year, Silverstone’s National Circuit will once again host the last two races of the season for Protyre Formula Renault BARC with the thriving junior championship now confirmed as a support class for the BTCC over the weekend 6th/7th October. Snetterton 200 Circuit in Norfolk will still host the first event of the campaign on Easter weekend, 7th/8th April, but instead of the previously announced date at Brands Hatch in mid-May, the series brings forward its visit to Rockingham in Northamptonshire – that event now scheduled for 19th/20th May. As originally revealed though, the first two meetings will continue to be triple-header events. From there, the championship will now go to the ultra-fast Thruxton Circuit in Hampshire for a one day outing on Sunday, 17th June, ahead of the annual trip to Croft in North Yorkshire on 21st/22nd July. The fifth date on the calendar marks a rescheduled visit to Donington Park in the East Midlands on 18th/19th August, rather than as support to the FIA British Truck Grand Prix at the start of July. There will then be a break of seven weeks ahead of the Protyre Formula Renault BARC season finale, the crown jewel event at Silverstone in support of the BTCC. If the 2011 instalment is anything to go by it will be massive, with tens of thousands of spectators sure to attend. “It’s fantastic news for everyone associated with Protyre Formula Renault BARC to have the final two rounds of the 2012 season supporting the BTCC”, said Championship Promoter Simon North, “We’re delighted to be able to confirm our position on the TOCA package for the Silverstone event once again, it’s a very prestigious slot and something which will only help teams attract top young drivers. Along with headline sponsor Protyre, the championship is additionally supported by ELF, Michelin and NGK Spark Plugs. All dates and venues specified remain provisional.